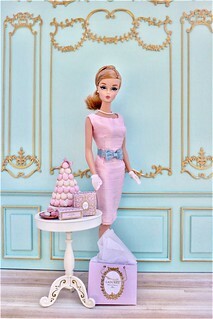 Those that know me, know that I am truly a BFMC (Barbie Fashion Model Collection) purist. The BFMC brought me to a place in collecting Barbie that I just can’t seem to shake, for 14 years now. A majority of my collection is now based around the BFMC. It is my true love in my collecting hobby. Recently I was revisiting a plan I have for artwork on my office portion of a wall within my doll room. I have had an idea for a few years now to feature old introductory ads for the BFMC on this wall. This introductory period was a time when magic happened within the Barbie collecting community. In the year 2000, the BFMC was introduced. 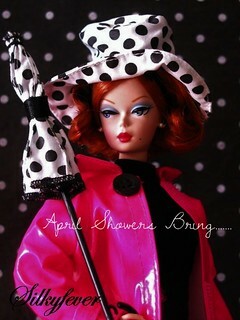 Many collectors were re-charged and excited by this new modern twist on this vintage faced Barbie. It was a magical time! When I look back at the ads during that time period for the collection, I am overcome with awe and inspiration. But it was not always that way for me. You might recall a story I shared in my introductory page for this blog. I share that in 2002 I discovered Lisette Silkstone Barbie at a local doll show. You may also recall that I went to that doll show in hopes of finding vintage Liddle Kiddle dolls, as this collector was on a Barbie collecting hiatus. At that doll show, I kept circling a Barbie dealer’s display that featured several current Barbies, one of which was Silkstone Lisette. 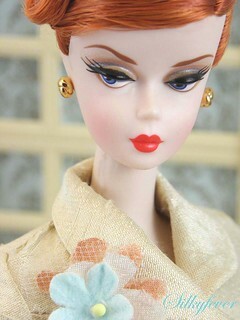 When I picked up that Lisette doll, I was an instant fan. I purchased her without batting an eye. It wasn’t as though I was not aware of the BFMC. After all, I had numerous copies of what was then “Barbie Collectibles” catalogs laying throughout my home. In fact, a couple of years prior, my boyfriend (now husband) stole a catalog from my townhouse when we were dating so that he could order the Barbie Coca-Cola Malt Shop for me for Christmas one year. How romantic is that!? The truth of the matter is this: When I saw that copy of the Barbie Collectibles catalog that debuted the first dolls in the BFMC collection (Delphine, L1, L2), I could have cared less. I honestly and truly despised Delphine’s look. I thought she was impossibly HAUGHTY. She did not look like Barbie to me, and I had no desire to purchase her what-so-ever. Of course, that would soon change. The day I purchased Lisette, I suddenly understood what this Silkstone collection was all about. As I drove home from that doll show, with Lisette in hand, all I could do was HOPE that this haughty Delphine looking character was still available to order. I walked through the door, and I then literally started rummaging through a pile of papers on my desk to find a copy of the catalog, that thankfully was still featuring Delphine. I called to order Delphine that very day. 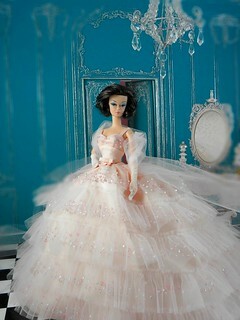 To this day, Delphine remains my favorite Barbie within my collection. So as I sat staring at these advertisements recently, I got to wondering just how long had it been since that fatal day I placed that fateful order? I checked my receipt: April 9, 2002. So for me, this will be my Anniversary date for my BFMC love affair. In my last post, I shared that I have been having a rough collecting year in this year 2016. A sincere lack of interest prevented me from having any enthusiasm for my passion. I have found that when I am longing for BFMC inspiration, I revert back to the good ol days of the collection, the debut year. I am instantly reminded of what brought me back to collecting in the first place, and the love for those days never gets old. One of the first print advertisements for the BFMC, featuring a glimpse of my all time favorite Barbie, Delphine. A two page spread that I consolidated here. Obviously that enormous pink gown was too big for a one page spread.